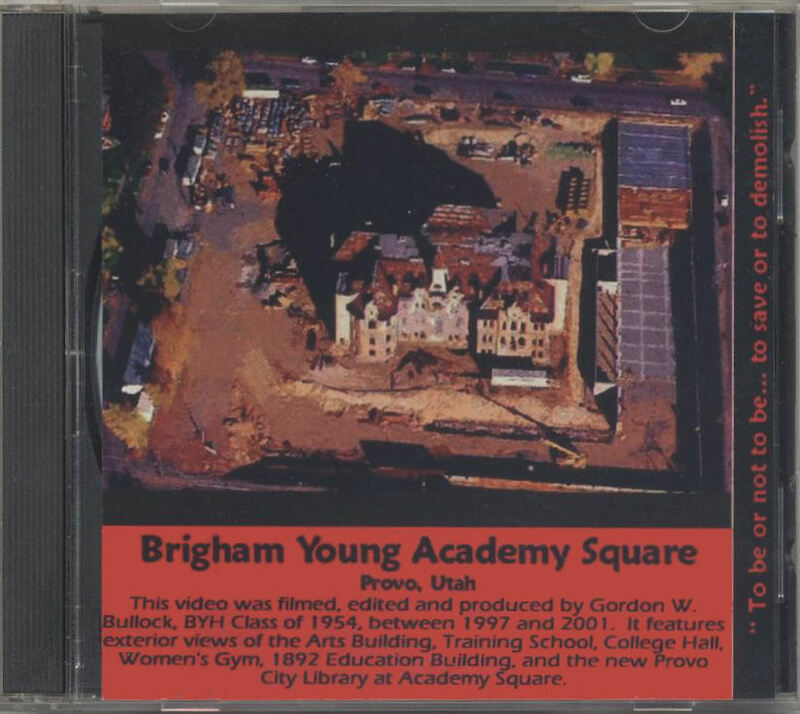 The purpose of this webpage is to inform Brigham Young High School alumni of the existence of a video of the Academy Square campus taken between 1997 and 2001. This video was privately filmed, edited and produced by Gordon W. Bullock, BYH Class of 1954. Working in radio broadcasting, Gordon started his filming in 1997, almost three decades after the doors of BYH were closed. He finished the video when the historic Education Building remodeling was completed and dedicated. He edited the film down to one hour of screen time. Originally produced on VHS tape, Gordon sold about 100 copies to his classmates and friends upon their request, then filed the master video away and went on to other activities. At the request of the BYH website, Gordon replaced his VHS tape version with a DVD disk version, and he began accepting new orders. His cost was still $15, and that included postage and handling. He titled his video "To be or not to be... To save or to demolish." Filmed in color, the video featured Gordon's narration along the way. Gordon opened his video with a personal introduction, pointing out the very real threat that every historic building on the Lower Campus block could soon be demolished. 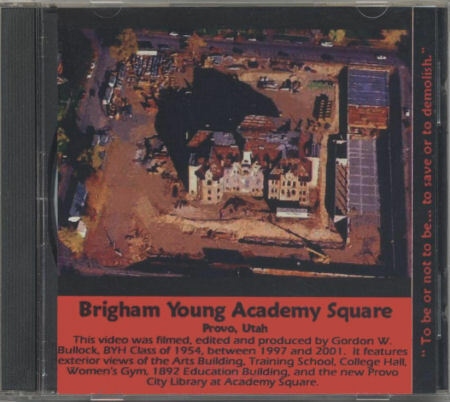 The video then covered the demolition of the Arts Building (known to earlier generations of BYH students as "the High School Building"), the Training School, and College Hall. He filmed many steps as contractors turned the original "High School Building", later known as the "Education Building", into just an empty shell, because it had to be completely gutted. 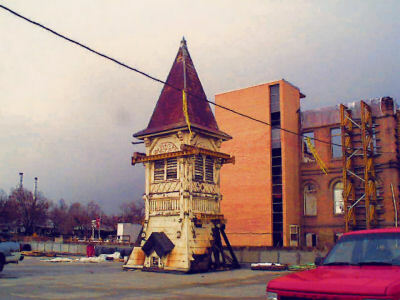 He documented the construction of a new roof that replicated the old one, topped by the original belltower, renovated. The Dedication Ceremony that officially opened the remodeled building was held on September 8, 2001. 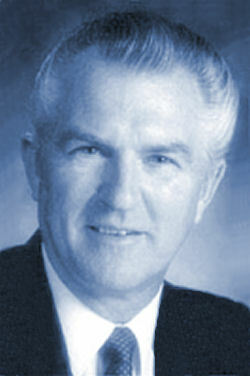 Gordon filmed several speeches at that program, including remarks of then-BYU President Jeff Holland, and the speech of Dr. L. Douglas Smoot, the one person most responsible for the miracle that saved the Education Building from destruction. Parenthetically, the last shots on the film were taken on the afternoon of September 11, 2001, following the tragic terrorist attacks in New York and Washington. This one-of-a-kind video has not seen much exposure, but it has been carefully preserved. Gordon provided a copy to Elder Dallin Oaks (President of the BYH Class of 1950). After Elder Oaks viewed the VHS video, he placed a copy in the Church Archives office in Salt Lake City. Notice: Due to the death of Gordon Bullock on July 15, 2006, we ask you respectfully to not contact the Bullock family about this video. We have asked the family if they wish to continue to provide these historic videos to BYH alumni, and they are not ready. If they change their mind, we will post a notice here. Orders can be sent, along with a check for $15, using the order form below. Please make checks payable to Bullock Family, Academy video. Click here for a PDF order form. Brigham Young Academy's Education Building was planned in 1884, completed in 1891, and dedicated in January of 1892. College Hall, the Training Building and Men's Gym, Industrial Arts Building, and Arts Building were all completed by 1903, and the Women's Gym was added in 1912. These historic buildings served first BYA, and then BYU and BYH concurrently until 1968, when the campus was sadly evacuated and then abandoned. 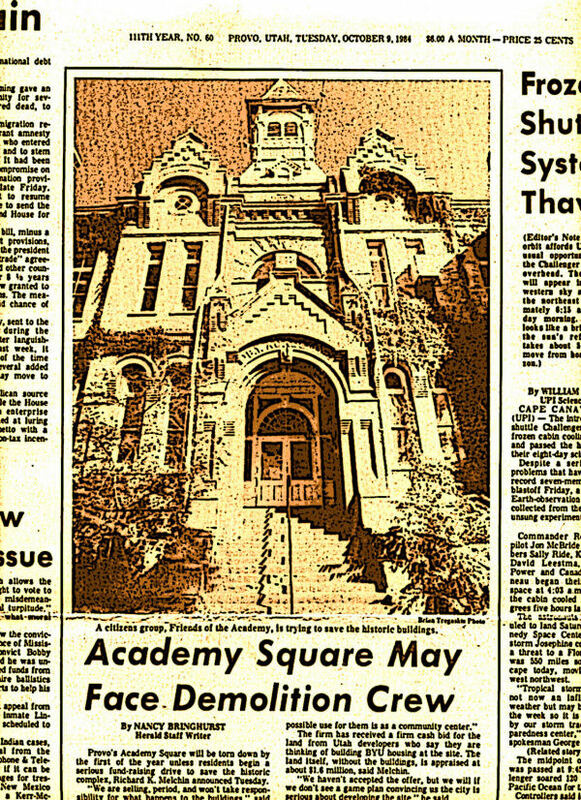 In 1975, on the eve of its Centennial, Brigham Young University literally placed its alma mater on the block and sold the Academy Square land and its historic buildings to commercial private interests. A 20-year era of neglect and frustration then ensued, unhappily marked by thirteen unsuccessful preservation or conversion attempts. The unoccupied buildings steadily deteriorated and were viciously vandalized to the brink of destruction. In 1994, Provo City stepped in to purchase the site with the stated intent of razing the buildings in favor of creating tax-producing commercial development on the historic block. It was to be akin to a mercy killing. The National Trust for Historic Preservation studied Academy Square and concluded that the Education Building was the most historically significant endangered building in the entire west. Theirs was a lonely voice in the wilderness. At that time, only a few dedicated die-hards in the community insisted that they wanted to see that building preserved, and even fewer thought it could be. In the summer of 1994, Provo City Mayor George Stewart invited interested citizens to take "hard-hat tours" through the severely dilapidated Education building. According to Brent Ashworth, BYH Class of 1967, the Mayor's tour was preceded by a speech from the fire chief to the crowd awaiting their tour, in which he frankly stated, "If there is a fire in that building, I have instructed my department to just let it burn down." In early 1995, the dispirited Brigham Young Academy Foundation, one of the few remaining organizations seeking historical preservation, first approached Dr. L. Douglas Smoot, a professor at BYU, and asked him to become involved. Dr. Smoot's initial reaction was a strong "No" -- but he couldn't stop thinking about this "mission impossible". Dr. Smoot said he began to sense an obligation to his great-grandfather, Abraham O. Smoot, the first chairman of the Brigham Young Academy Board of Trustees, who had put his heart and soul into the Academy from 1875 to 1895. There is no doubt that, without the subsequent untiring leadership of Dr. Douglas Smoot and more than 8,000 hours of his service to the cause, the historic Education Building would now be gone and lost forever. Instead, the fourteenth effort at preservation succeeded in what has become known as The Miracle at Academy Square. The Brigham Young High School website is a nonprofit, volunteer-operated entity. The website receives no money from the sale of any books or videos that are mentioned on this website. Historical materials are mentioned as a service to alumni and friends of Brigham Young High School.